The Bryans family has four amazing children. Luke, Jordan and Molly were all born at CHRISTUS Mother Frances Hospital- Tyler, but 2018 Miracle Child, “Joyful” Jack came into the Bryans family a little differently. Parents, Renae and Casey, became licensed foster parents in April 2013 and quickly received a call for their first foster child, a 3 week old baby boy who was in the Neonatal Intensive Care Unit at CHRISTUS Mother Frances- Tyler due to “failure to thrive”. After meeting Jack and caring for him alongside the NICU team, Renae and Casey took their baby boy home, knowing he would have some developmental delays. Joyful Jack was right at home with the Bryans family, and they eventually adopted him into their brood of three biological children. Jack continued to show signs of significant developmental delays, and his parents became increasingly concerned. Jack’s mother, Renae, recalls his first birthday, when he was unable to sit up on his own. The Bryans knew they were facing something more complicated than general developmental delays. 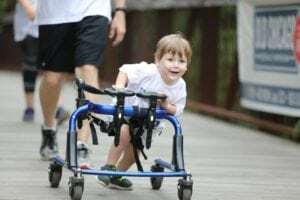 They consulted CHRISTUS Trinity Clinic pediatrician, Dr. Mark Barret, who ran a series of tests including an MRI that revealed lesions on Jack’s brain and evidence of a metabolic disease. On January 22, 2016, after an extensive battery of tests, Jack’s diagnosis was confirmed as Leigh’s Syndrome. Leigh’s Syndrome is a severe, progressive, and currently incurable neurometabolic mitochondrial disease that affects the entire body. When Jack spikes a fever, it is an emergent situation because damage can occur to his brain very quickly. With the help of Dr. Mark Barret and CHRISTUS Trinity Clinic Special Needs Program nurse Molly Brown, Jack’s treatment protocol is on record at the CHRISTUS Mother Frances Hospital Emergency Department. Unfortunately, Jack has had to visit the emergency room on a couple occasions and was admitted each time to the Children’s Care Center where Child Life Specialist, Brittany Grimm, was on hand to care for Jack and his family. Brittany helped guide Jack through procedures like having an IV line placed, and he managed to laugh and smile through his discomfort. You can help children like Jack Bryans by supporting Children’s Miracle Network Hospitals. One hundred percent of the funds raised locally for Children’s Miracle Network Hospitals stay at CHRISTUS Trinity Mother Frances Health System to provide life-saving pediatric equipment and medical services to children in our area.